Many translators I speak to manually keep rough track of how many words they translate per day, though it is time consuming and cumbersome. 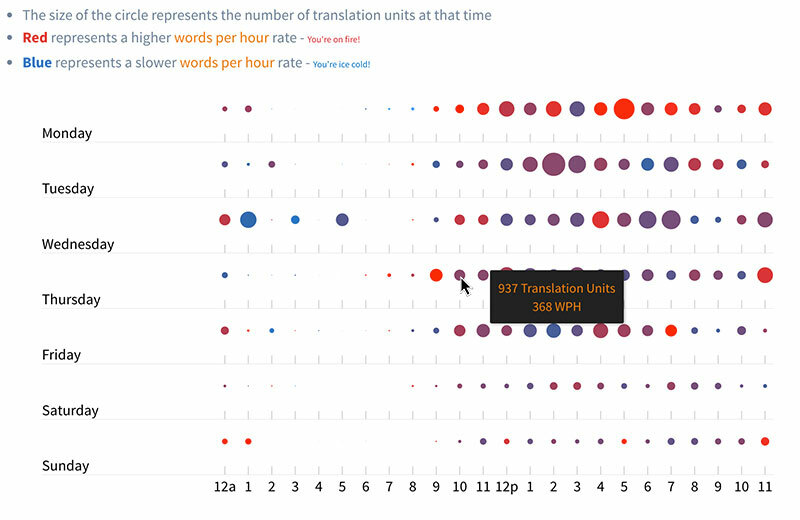 Others are not aware that the CAT tool that they are using has been timestamping their translation units. Usually CAT tools automatically put a timestamp on the translation units and if the file is exported as a TMX file this time data is preserved. However, without the ability to analyze the data, it is pretty useless. As this data can help you in many ways, TM-Town includes a tool that automatically extracts productivity data from your translation memory (TM) files - data that was hiding that you might have never known was there. By understanding your productivity you will be able to better manage your schedule as well as keep your clients happier as you will have your past data to help you make better estimates. What day am I most productive? How many words do I average per day? Do I get more work done in the mornings, afternoons or nights? What language pair am I most efficient in? What specialties take me longer? What specialties am I quickest at? What time of year do I have capacity to take on more work? How many words can I translate in one day if I really had to? With your TM data uncovered you will be able to better understand and manage your productivity. Additionally, you might learn some interesting things about your work rate that you never knew. Register for your free TM-Town account and give these tools a try!